My kids absolutely love surprising friends and neighbors by leaving treats on the doorstep, ringing the doorbell, and running as fast as they can to get away before the door opens. We do it throughout the year just for fun, but it’s also a part of some of our favorite holiday traditions, like Halloween (You’ve Been Boo’ed). 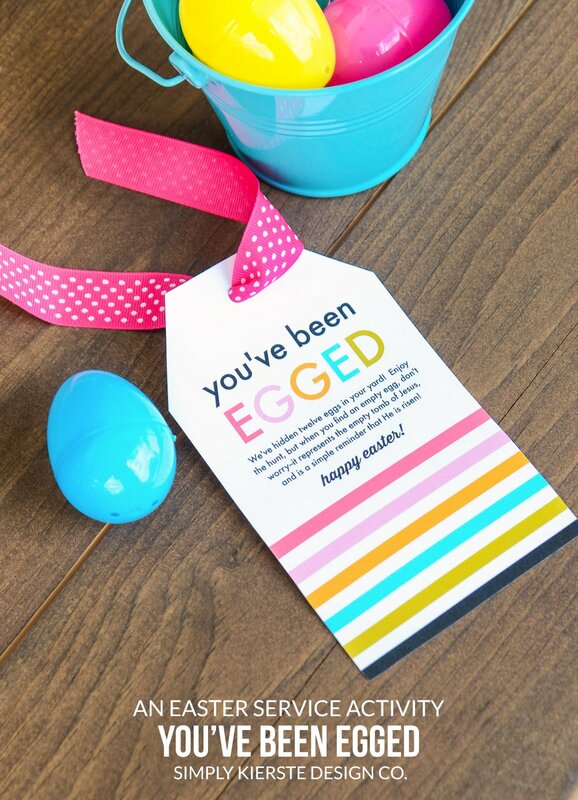 Easter is a wonderful time to spread a little cheer, and the perfect time to say “You’ve Been Egged!” It’s our same favorite family activity, with an Easter twist! It’s so fun and simple to put together, and you’ll not only be touching others’ lives, but making family memories. It’s one of the ways our family can focus on and celebrate the meaning of Easter. We love to do it for a Family Night (Monday nights at our house) in the weeks before Easter, and do a few different families. 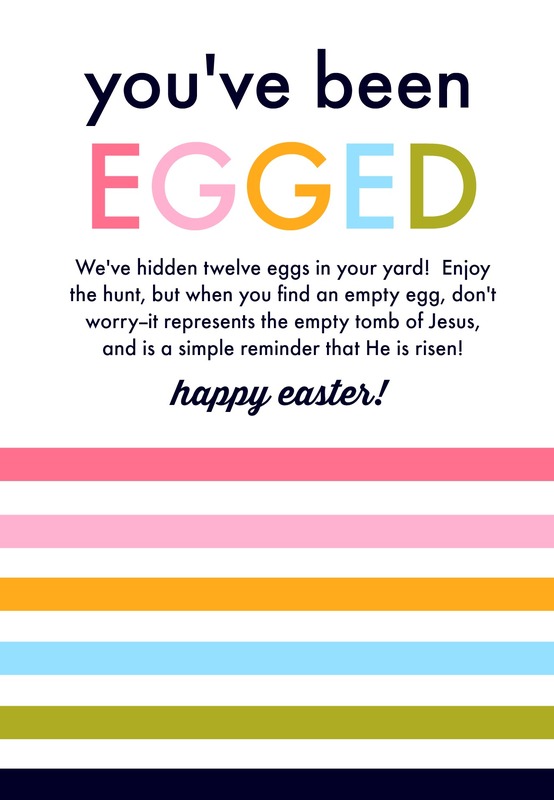 -Fill the 12 eggs with candy or other small gifts. We like to leave one empty, to represent the empty tomb of Jesus, as a simple reminder that He is risen. -Very quietly (this is the time to be sneaky! 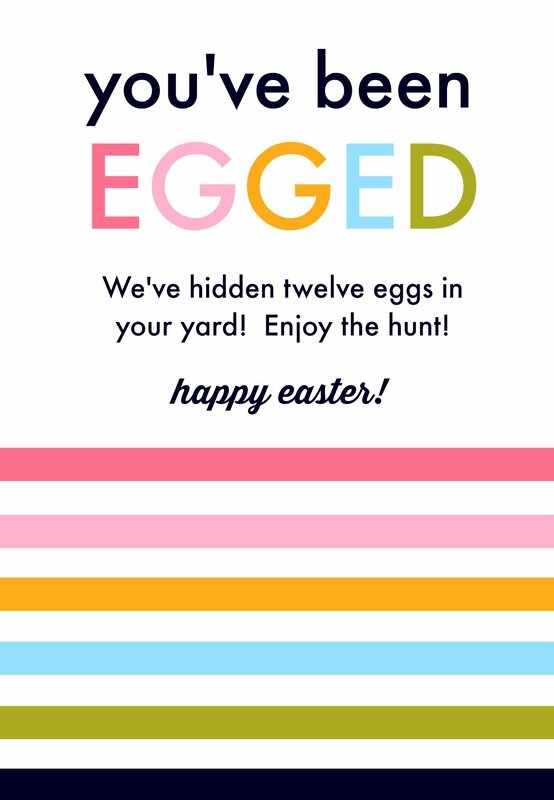 ), hide the eggs in someone’s yard, then tie the printable tag on to the front door. I like to leave a pail or basket for them to gather the eggs in, but that’s totally optional. You can right click on one of the images below and save to your computer, or just click on the PDF file below–it has all the images on it. *COPYRIGHT KIERSTE WADE (SIMPLY KIERSTE DESIGN CO.), FOR PERSONAL USE ONLY. NOT INTENDED FOR RESALE OR DISTRIBUTION. Totally doing this with the kids! They will absolutely love it. Thank you so much for sharing this idea. We’ve been “boo-ed” before, but never egged!! So cute! 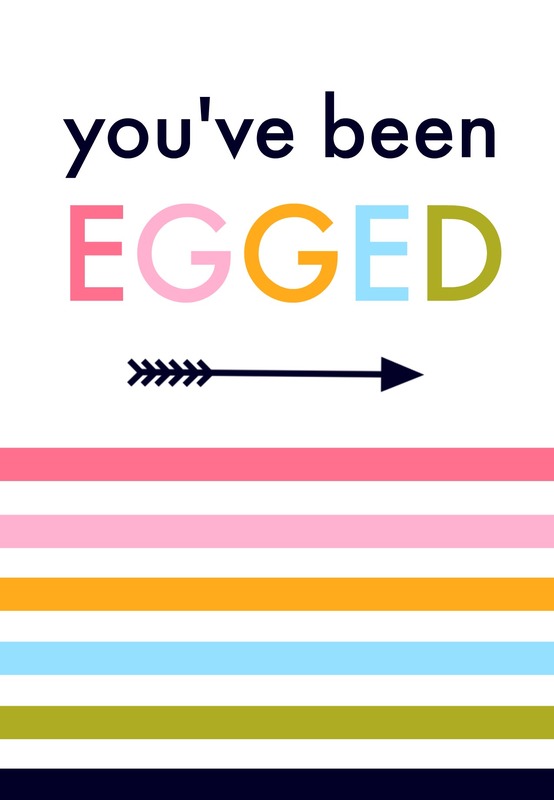 I’ve never heard of “being egged!” I’ve ‘boo-ed’ friends, “whisked” them a Merry Christmas, “frogged” them on Leap Day…and now I can add this to be arsenal of fun! I always enjoy your ideas and emails! Love the idea! Thanks so much for sharing the cute printable. We’ll be trying this for family night tonight!